I Hit a Parked Vehicle and Can’t Find the Owner – Do I Leave? 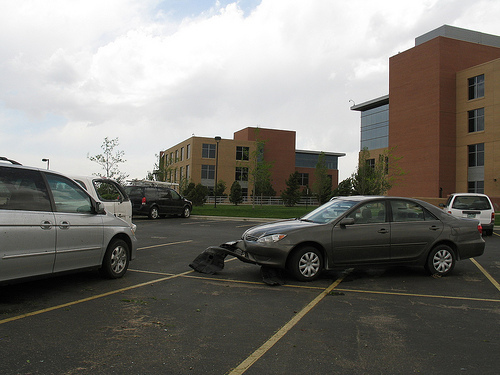 Hitting a parked vehicle, though embarrassing and inconvenient, could become much more than a nuisance if you simply leave the scene of the accident. If you hit a parked vehicle, you must provide your name, address, and vehicle registration number in a visible place on the vehicle that you hit. If you do not own the vehicle, you must provide the vehicle owner’s name and address. Though hitting a parked car in a parking lot or on a street is not likely to result in physical harm to another, if it were to cause physical harm to another, failing to stop then becomes a fifth degree felony. A fifth degree felony means a possible fine of $2,500 and six to twelve months in jail. Again, though unlikely in the case of hitting a parked car, if the accident were to result in the death of a person, failure to stop after an accident is a third degree felony. A third degree felony can mean up to a $10,000 fine and nine to 36 months in jail. In addition to the fines and jail time, leaving the scene of an accident will carry a class five driver’s license suspension penalty. The driver’s license suspension can be for a minimum of six months and a maximum of three years. Ready for more bad news about leaving the scene of an accident? A hit and run offense conviction will automatically add six points to your driver’s license. Accumulating 12 points in two years will cause another driver’s license suspension. And if that’s not bad enough, your insurance company will likely raise your insurance rates or no longer cover you when you are able to drive again. Any accident, even with a parked vehicle, is a frightening experience. The first instinct may be to get away from the frightening event, but you must resist the urge to leave. Facing the music is a much better course of action, rather than the potential damage to your record and your future. If you have had the misfortune to be involved in a hit and run, get the help of a qualified, experienced, and trusted hit and run defense lawyer working for you. If you are facing hit and run charges in Columbus, Ohio, you need an attorney who knows the law and can help defend you aginst these serious charges. Get the representation of a skilled and trusted attorney who can give you the help you need. The Maher Law Firm can make sure that your rights are protected. Founding attorney, Colin Maher has in-depth knowledge and experience working on hit and run defense cases and he will put his skills at your service. Call The Maher Law Firm today for a free consultation at 614-205-2208 or contact us online.